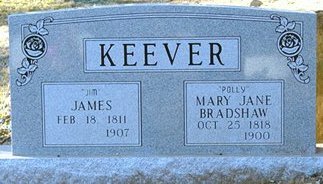 James Keever, son of Thomas Keever and Nancy Reel, wife of Mary Rebecca Jane Bradshaw. Mary Rebecca Jane Bradshaw, daughter of John Bradshaw and Mary "Polly" Shutly, wife of James Keever. 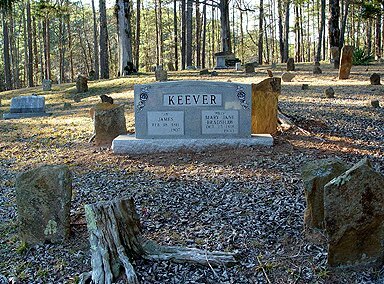 Mrs. James Keever died at her home on Monday of last week, and was interred at the Macedonia cemetery on Tuesday. Rev. A. J. McCoy conducted the funeral services. She was very old and a Christian from her 14 th year. through the war, later becoming the father of many children. to a new building on the highway between Cartersville and Canton. All that remains at the original location is the church cemetery. toilet so that James could walk to the toilet without help.